We’d love your help. Let us know what’s wrong with this preview of Santa Puppy by Lynn Cahoon. ’Twas the season of Christmas, and all through South Cove, California, Santa is working overtime to deliver a special gift . . .
Jill Gardner has volunteered her Coffee, Books, and More to host a Christmas adopt-a-pet party. Among the potential forever friends is a male terrier named Baby, whose owner died of a heart attack. With few clues to go on, even finding the name of ’Twas the season of Christmas, and all through South Cove, California, Santa is working overtime to deliver a special gift . . .
Jill Gardner has volunteered her Coffee, Books, and More to host a Christmas adopt-a-pet party. Among the potential forever friends is a male terrier named Baby, whose owner died of a heart attack. With few clues to go on, even finding the name of Baby’s human is a daunting task. But there’s no challenge too big for Jill this holiday season. To ask other readers questions about Santa Puppy, please sign up. One of my favorite amateur sleuths is back. Jill Gardner, owner of Coffee, Books and More, finds herself in the middle of another mystery. She is hosting a local adopt-a-pet function and her heart is breaking for Baby, a male terrier whose owner recently died. Baby’s owner was a homeless man. Jill is sure there is more to his story than they know about. She vows to find out what happened to the man and to make sure Baby has a new “forever home”. Little did she know, she’d be delving into the pas One of my favorite amateur sleuths is back. Jill Gardner, owner of Coffee, Books and More, finds herself in the middle of another mystery. She is hosting a local adopt-a-pet function and her heart is breaking for Baby, a male terrier whose owner recently died. Baby’s owner was a homeless man. Jill is sure there is more to his story than they know about. She vows to find out what happened to the man and to make sure Baby has a new “forever home”. Little did she know, she’d be delving into the past and uncovering some surprising things. Yay! A new entry into the “A Tourist Trap Mystery Series”. I love this series so much and this is another wonderful addition to it. Santa Puppy is a novella and a fast read. This book tore my heart apart. Lynn Cahoon, once again, gives her readers an amazing story in a small package. Although it’s a short read, it’s not short on emotion. I found myself crying at the end. This is a quick read for the holidays. It’s a true “feel good” read and perfect for this time of year. I am really looking forward to the next book in this series. Since the book brought me to tears, I can’t help but give it five stars. This wonderful Christmastime novella will put you in good spirits for the holidays! Jill and the South Cove gang are volunteering at an animal shelter helping groom dogs and cats for an upcoming adoption event. An older terrier mix, Baby, catches Jill’s eyes, and his background is tied to a recent death, and the heartfelt story of his owner’s past. A happy ending is the gift Cozy Mystery Readers receive at the story’s end. Cookie recipe included. Oh my gosh did I ever enjoy Santa Puppy. It was not at all what I expected! So much better! This Christmas themed novella is the perfect holiday read. Short, sweet and really well written. The story will tug a bit at your heartstrings but in a really good way. I love this series and it was easy to picture the entire setting, the characters and even taste the cookies! I am totally using the recipe at the end of this story too! This is a terrific holiday novella that hits all the right Christmas notes. I enjoy these peaks into the lives of the residents of South Cove. A good, easy read with heartwarming family/friend moments. It was bittersweet but with a very sweet ending. And it's really gotten me impatient and excited to decorate our tree when I get home in a couple of days! It is Christmas time in South Cove California and Jill Gardner is planning to host an adopt-a-pet at the bookstore. Jill learns of a death of a homeless veteran and he had a small dog who stay with him.. Jill becomes interested in his story and tried to find his sweetheart. Her parents moved her away when he was overseas and there is no trace of where. There is a small amount of paranormal and a couple of twists that will delight and distress you. I highly recommend this book for a relaxing Chri It is Christmas time in South Cove California and Jill Gardner is planning to host an adopt-a-pet at the bookstore. Jill learns of a death of a homeless veteran and he had a small dog who stay with him.. Jill becomes interested in his story and tried to find his sweetheart. Her parents moved her away when he was overseas and there is no trace of where. There is a small amount of paranormal and a couple of twists that will delight and distress you. I highly recommend this book for a relaxing Christmas novella. Santa Puppy by Lynn Cahoon is a sweet little Christmas time mystery set in Ms. Cahoon's Tourist Trap world. Jill and her family and friends are putting on an adoption party for a local animal shelter to help place senior dogs and cats. There's one sweet little dog who captures Jill's heart as his master recently passed away from a heart attack and he has no living family. Jill does fina a clue and then Greg provides a few more clues which spurs Jill on to find out what she can about the man. This Santa Puppy by Lynn Cahoon is a sweet little Christmas time mystery set in Ms. Cahoon's Tourist Trap world. Jill and her family and friends are putting on an adoption party for a local animal shelter to help place senior dogs and cats. There's one sweet little dog who captures Jill's heart as his master recently passed away from a heart attack and he has no living family. Jill does fina a clue and then Greg provides a few more clues which spurs Jill on to find out what she can about the man. This is a novella that kept me turning the pages and I breathed a happy sigh and a few tears at the end. Santa Puppy by Lynn Cahoon is novella number 9.75 in A Tourist Trap series. Jill Gardner who owns Coffee, Books, and More has agreed to host Christmas Adopt-a-pet party. Jill takes on another mystery, finding information about the human of a terrier dog names Baby, who's owner died of a heart attack. I enjoyed this short book, but I prefer this author's full size novels. I recommend this novella for a quick, fun Christmas story. This is my first ever read from Lynn Cahoon. I wanted to try this series because I liked the sound of the concept but another thing that drew me to this novella was the fact that it was also holiday themed. SANTA PUPPY is book 9.75 in the Tourist Trap mystery series and you definitely don’t need to read the others to enjoy this one. I really like Cahoon’s writing style. It’s quite simple and easy to read, so I think that helped me in jumping into this series in the middle of it. Santa Puppy is just the right holiday story I like. When a homeless man is found in the beach, dead of a heart attack, Jill Gardner wonders who he is. Santa Puppy touches on the kindness of people, heart ache and of course, Christmas. This is a delightful, fast paced story that is read in under two hours. I volunteered to read and review an ARC of this book provided by the publisher and NetGalley. This is a great novella and perfect for a quick Christmas read. I enjoyed getting to spend more time with Jill, her family and friends. Jill is so kind and caring and has a really big heart. I enjoy reading about her interactions with the other characters, including the animals. Although someone does die, I found the fact the Jill did not discover a dead body refreshing. There is a mystery to solve, but it was not who the killer was. I enjoyed this change of pace. The author is very talented in her descriptive writing and she brought South Cove, California, alive in my mind. The writing style flows smoothly and this novella is a quick easy read. I would recommend this novella, and whole series, to anyone who enjoys a well crafted cozy mystery. There is a message of caring and sharing, and helping others, that we can all be reminded of. If you are looking for a quick Christmas read, pick this book up. I voluntarily reviewed an ARC of this book provided by the publisher, Kensington Books, and NetGalley, which I greatly appreciate. Thanks to Netgalley and the publisher for the chance to read this book! If you're looking for a cute cozy mystery to read in the lead up to Christmas, then this book might be the one! It's only a quick read at 130 pages, but somehow plenty was packed into that short amount and I felt like I not only enjoyed what I got, but that I wanted to read more of this series and discover more about the characters. Any character that reads is a plus with me, and add in animals and recue and I was completely Thanks to Netgalley and the publisher for the chance to read this book! If you're looking for a cute cozy mystery to read in the lead up to Christmas, then this book might be the one! It's only a quick read at 130 pages, but somehow plenty was packed into that short amount and I felt like I not only enjoyed what I got, but that I wanted to read more of this series and discover more about the characters. Any character that reads is a plus with me, and add in animals and recue and I was completely sold. Ottimo racconto letto la vigilia di Natale. Santa Puppy by Lynn Cahoon is a Tourist Trap Novella. Jill Gardner of Coffee, Books and More will be hosting a pet adoption event next Saturday at the store to help some adorable animals find forever before Christmas. In anticipation of the event, Jill along with Greg King and her friends are at the Bakerstown shelter to wash the dogs. Jill meets Baby, a ten year old terrier who arrived at the shelter after his owner was found dead on the beach the previous week. Jill takes off his collar and a Santa Puppy by Lynn Cahoon is a Tourist Trap Novella. Jill Gardner of Coffee, Books and More will be hosting a pet adoption event next Saturday at the store to help some adorable animals find forever before Christmas. In anticipation of the event, Jill along with Greg King and her friends are at the Bakerstown shelter to wash the dogs. Jill meets Baby, a ten year old terrier who arrived at the shelter after his owner was found dead on the beach the previous week. Jill takes off his collar and a safety deposit key falls out. Greg King, a South Cove police detective, obtains the items from the box hoping it will provide them with the deceased identity. The contents of the safety deposit box provide Jill with a mystery to wrap up before Christmas. Santa Puppy is a cute and uplifting cozy mystery. There is an adorable dog that misses its owner and a deceased human that the police have been unable to identify. All our favorites characters from A Tourist Trap series are back in this Christmas novella (120 pages). I found Santa Puppy to be well-written and it moves along at a fast clip. I would suggest reading one of the full length novels in A Tourist Trap Mystery series prior to reading Santa Puppy. The story has a good moral plus it highlights the plight of our veterans. There is a hint of Christmas magic at play in this engaging Christmas story (I do not want to spoil it for you). Santa Puppy is a heartwarming Christmas cozy with a sweet ending. A Christmas Novel featuring Tourist Trap characters. Fundraising for the local no-kill animal shelter and finding homes for older pets has Jill busy as Christmas approaches. The death of his owner has one elder dog, Baby, hiding a mystery in his collar in the form of a key. Plot twists made this a good read. Santa Puppy is a short and sweet addition to the Tourist Trap series. It is Christmas in South Cove and to help others, Coffee, Books, and More is hosting a party for the local animal shelter. Senior dogs and cats are going to be at the shop for customers to go and visit with and hopefully, adopt. The Saturday prior to the event, Jill, Greg, Aunt Jackie, Harrold, Amy and Justin go to the shelter and wash thirty dogs to get them prepped for the event. One of the dogs is a terrier whose owner, Tho Santa Puppy is a short and sweet addition to the Tourist Trap series. It is Christmas in South Cove and to help others, Coffee, Books, and More is hosting a party for the local animal shelter. Senior dogs and cats are going to be at the shop for customers to go and visit with and hopefully, adopt. The Saturday prior to the event, Jill, Greg, Aunt Jackie, Harrold, Amy and Justin go to the shelter and wash thirty dogs to get them prepped for the event. One of the dogs is a terrier whose owner, Thomas, was recently found dead of natural causes. While Jill is bathing Baby, his collar falls apart revealing a small key to a safe deposit box. Greg takes the key and discovers a journal, letter and fifty eight thousand dollars saved to purchase a dream home for him and his high school sweetheart Lizzie. The two went to Bakerstown High but he joined the Army after graduation. While he was away, her parents moved away to Oregon to separate the two. He never found her again but he never forgot her. Jill has Greg's blessings (this time) to find out as much as she can about his story. While Thomas' story was sad, all ends well and in a surprising way. As all books in the series, expect some yummy desserts, this time in the form of a cookie exchange, including a recipe. Jill gets a real tree this year and so does Greg for the station and conference room where the exchange is held. This is a fun Christmas story with the theme of helping others. Santa Puppy is the latest installment in Lynn Cahoon’s Tourist Trap Mysteries. This novella is a quick and easy read that can easily be read as a standalone. Ms. Cahoon’s writing style flows smoothly at a steady pace in this well-written story, with well-developed and affable characters. Jill Gardner owns Coffee, Books, and More in the quaint small town of South Cove, California. She’s hosting an adopt-a-pet event and she and her boyfriend, Detective Greg King, join her best friend, Amy, and her Santa Puppy is the latest installment in Lynn Cahoon’s Tourist Trap Mysteries. This novella is a quick and easy read that can easily be read as a standalone. Ms. Cahoon’s writing style flows smoothly at a steady pace in this well-written story, with well-developed and affable characters. Jill Gardner owns Coffee, Books, and More in the quaint small town of South Cove, California. She’s hosting an adopt-a-pet event and she and her boyfriend, Detective Greg King, join her best friend, Amy, and her boyfriend, Justin, her aunt, Jackie, and her boyfriend, Harrold, to help groom and dogs for the event. While at Bakerstown Shelter, a sweet ten-year-old male terrier named Baby catches Jill’s eyes. She learns Baby’s owner was a homeless man who recently passed away from a heart attack on the beach and her heart is breaking for Baby. When Jill takes Baby’s collar off, she finds a key and asks Greg to try to find out what it goes to. Greg learns the homeless man’s name was Thomas Raleigh and that he left a journal, plus a letter and lots of money for a woman named Lizzy, the love of his life. After reading the letter and journal, Jill’s determined to find out what happened to him and to make sure Baby has a new “forever home,” even if it’s with her. 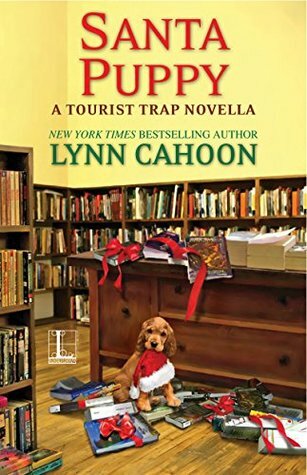 Santa Puppy is the latest addition to Lynn Cahoon’s Tourist Trap Mysteries. It is the Christmas season, and as part of the festivities Jill Gardner, owner of Coffee, Books, and More, is set to host a Christmas adopt-a-pet party. Her group of friends, including her beau, South Cove’s police detective Greg King, meet at the animal shelter that will be bringing the animals for adoption, to bathe and get the pets ready for the event. 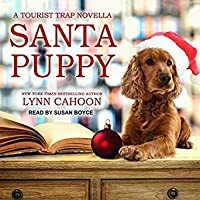 A new inhabitant at the shelter, a 10 year old terrier called Baby Santa Puppy is the latest addition to Lynn Cahoon’s Tourist Trap Mysteries. It is the Christmas season, and as part of the festivities Jill Gardner, owner of Coffee, Books, and More, is set to host a Christmas adopt-a-pet party. Her group of friends, including her beau, South Cove’s police detective Greg King, meet at the animal shelter that will be bringing the animals for adoption, to bathe and get the pets ready for the event. A new inhabitant at the shelter, a 10 year old terrier called Baby, was brought in when his owner was found dead of natural causes on the beach. From Baby’s tattered collar a small key falls, thus opening a mystery to be solved. What is learned about the homeless veteran is the basis for the remainder of the story. Exploring such topics as homeless veterans, interracial relationships, and the placement of senior pets, this is a touching holiday tale that will leave you with a sense of satisfaction. I did enjoy this novella and would recommend it. This Christmas, Jill is hosting an adopt-a-pet event at her coffee/bookstore. When bathing a sweet pup whose owner has recently passed away reveals a safety deposit box key Jill is on the hunt to find out what is in the box and to find the pup a "furever" home for Christmas. For me, this was the perfect introduction to the Tourist Trap cozy mystery series by Lynn Cahoon. I was captivated by Jill and her love for reading and animals. You can read this novella out of order as your first introductio This Christmas, Jill is hosting an adopt-a-pet event at her coffee/bookstore. When bathing a sweet pup whose owner has recently passed away reveals a safety deposit box key Jill is on the hunt to find out what is in the box and to find the pup a "furever" home for Christmas. You can read this novella out of order as your first introduction with no problems at all. There are plenty of mentions of things in the past but all the mentions do is make you want to drop everything and read the series from the beginning. This is not your typical happy ending so you will find yourself a tad teary at times. Unfortunately, I think there are more stories like this in the real world. Jill Gardner, owner of Coffee, Books and More, has volunteered to host a Christmas adopt-a-pet event. One of the dogs that touch her heart is a little terrier named Baby whose owner was homeless and died of a heart attack. As Jill looks into the homeless man’s past, she discovers a sad love story that needs a Christmas miracle. I loved this little mystery. It had a theme that touched my heart. Pets become a part of the family, and help us make our lives whole. They can help us heal through the tu Jill Gardner, owner of Coffee, Books and More, has volunteered to host a Christmas adopt-a-pet event. One of the dogs that touch her heart is a little terrier named Baby whose owner was homeless and died of a heart attack. As Jill looks into the homeless man’s past, she discovers a sad love story that needs a Christmas miracle. I loved this little mystery. It had a theme that touched my heart. Pets become a part of the family, and help us make our lives whole. They can help us heal through the tumultuous times in our lives. I received an Advanced Reader Copy of this book from NetGalley and am voluntarily reviewing it. This was another really sweet novella, a bit predictable but sweet none the less. Jill Gardner and her friends are back in this holiday story of the Tourist Trap Mysteries series. This time they are getting ready for their Christmas party which will include animals for adoption from the local animal shelter. The gang goes to the shelter ahead of time to help wash the pets to get them all cleaned up for adoption. While there, Jill falls in love with a dog named Baby. His owner was found dead on the beach with Baby sitting by his side. Jill seeks to find out more information about the owner in hopes of placing Baby into the right hands. This book is a novella, and it is a quick, fun read. It can easily be read in one setting. There is not really any new character development of the main players in this series. That works for this novella though, because the story centers around Baby, his owner, their story, and of course the true meaning of Christmas. There is a small, mystical element to the story that I found unnecessary but not distracting. I can wholeheartedly recommend this book to those who love holiday stories and cozy mysteries. Enjoyable, quick read Novella. Just in time for Christmas. This novella is a bit out of sync with the Tourist Trap Mystery series. This story occurs somewhere in the middle, chronologically. Relationships are a little different. Still a good story and worth reading.